A few times a year, I pack up and head off for new adventures. Okay, at this stage, the new adventures usually involve a trip with my son over spring break, and a trip to wherever FinCon is being held, with a sprinkling of camping weekends throughout the summer. Even though I’d like to think that I’m going to have a work-free/stress-free vacation, the reality is that I’ve almost always got something to do while I’m away. Whether it’s answering emails or working on just one more post, there’s work to be done. So, how do you fulfill your responsibilities while still having a nice time away from home? Here are some of the things I do to make sure I get stuff done while I travel. By the end of any trip, I am tired. I’m not interested in doing anymore work, and I’m likely to avoid it. So it makes sense for me to do as much as I can early in the trip. I try to get work done while sitting in the airport, as well as flying on the plane. I prioritize my to-do list, making sure that I get the most important things done early in the trip. The earlier you can get done with these things, the better. You’ll have better quality work, since you won’t be completely worn out, as well as get more done in a shorter period of time. It’s amazing how much work you can get done when you don’t have access to the Internet. For me, it’s concentrated work time, in which I bang out several posts at once. Once I get on an airplane to anywhere, it’s time to get as much done as possible. And I am insanely productive on the airplane ride to anywhere. It’s true that many planes now offer Wi-Fi while you are in the air, but I’m still not interested. First of all, I get a lot more done when Internet isn’t an option. Second, the Wi-Fi on some flights is expensive. I’m not paying $6 to $10 an hour for Internet access. Prioritize to figure out what needs to be done, and then do it while you don’t have Internet access. You’ll be amazed at what you can get done. 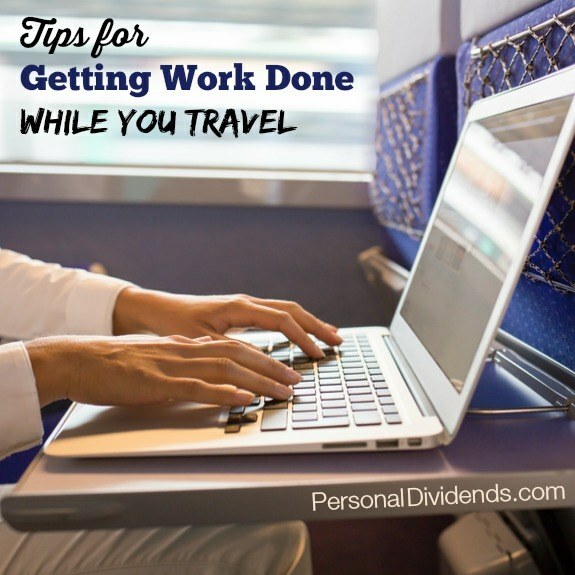 When you’re traveling, your work schedule resembles the home business owner’s schedule. This means that the majority of your work gets done in the morning and in the evening. Sometimes I get up earlier in order to get more done before the fun starts. Then, at the end of the day, I try to squeeze in a little more as my son heads to bed. Sometimes I take a shower to wake me back up for an hour or so, just to power through. It’s not always fun to have to work while you travel. However, sometimes it’s a necessity. If you bring your work along, you will need to figure out how you can best accomplish everything you want to do, workwise and funwise.